Opto 22 announces availability of the groov EPIC Learning Center, a comprehensive hardware and software benchtop system for learning and development. This fully operational package lets engineers, technicians, and developers initialize, configure and program the control, visualization and communication aspects of their groov EPIC systems. The Learning Center is an ideal companion for Opto 22’s free online self-guided groov EPIC learning modules, and it includes two seats for premium on-site training at company headquarters in Temecula, California. Hardware in the Learning Center includes a groov EPIC processor, power supply, four-position chassis, DC input and output modules, a temperature input module and an analog input module. Hardware is assembled on a desktop operator load panel accessorized with two illuminated pushbuttons, a potentiometer, a temperature probe, a Sonalert alarm and a red/blue/green LED indicator. All of this is delivered in a robust Pelican case, and it even comes with a screwdriver for releasing and tightening terminal connectors. Whether taking advantage of free self-guided OptoU Online Training learning modules (visit https://training.opto22.com) or experimenting on their own, engineers will benefit from the practical hands-on experience gained with the Learning Center. Some initial steps include organizing access levels, establishing network connectivity, calibrating the integrated touchscreen and using groov Manage to configure I/O. 61131-3 compliant language, including ladder logic. Simple examples are provided, and engineers can build and create their own applications as desired. Even more advanced custom programs are possible using the optional SSH access to the Linux operating system. Rich HMI displays with graphics and trends can be developed using groov View and viewed using the integrated display, mobile devices and web browsers. Communications are easily set up using Ignition Edge Gateway for connecting to legacy PLCs. The Learning Center is an ideal environment for exploring the collecting and publishing of tag information to cloud services with MQTT and Sparkplug, as well as obtaining other cloud data like database and weather information through Node-RED. Engineers can create Proof of Concept projects, like confirming how to install hardware on a machine, using the integrated touchscreen display as an HMI, connecting an external monitor, and establishing remote connectivity to a computer or mobile device. The Learning Center is thus perfectly suited for supporting pilot project development. 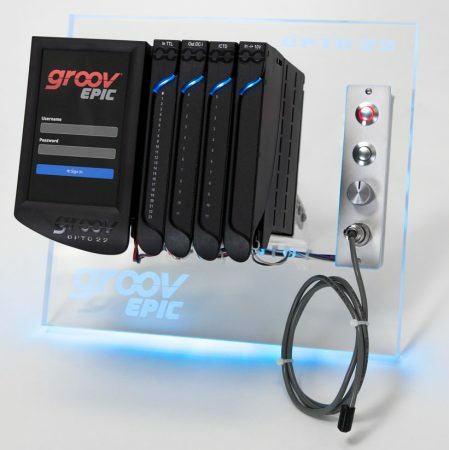 The Learning Center is an essential and complete way for engineers and developers to fully understand the many ways that groov EPIC can improve their automated operations and connectivity. Based on Opto 22’s 45 years of experience as an automation manufacturer, the Learning Center is not just a product sample, but instead delivers the same actual field-proven hardware and full-featured software used all over the world to automate and communicate with various machines and processes.